That’s certainly what happened in Lydic’s case, with the added bit of irony that the materials he welds together to create these animals often include old wrenches, saw blades, and other discarded tools. Though he had to nurture his love for tools, his affinity for subjects found in nature was never in question. His extensive studies in biology, including a master’s degree, all required time in the field and introduced him to a range of wildlife, including salamander communities in Great Smoky Mountains National Park. After school, he went on to work at the Erie Zoo in Pennsylvania and National Aquarium in Baltimore. At the aquarium, he warmed to the world of power tools while helping build sets for exhibitions. After he and his wife, Jill, moved to Bat Cave in 2001, he started toying with the idea of working with metal. For a birthday surprise, Jill arranged for him to spend the day observing a blacksmith. Afterward, he was hooked and began frequenting the studio to try his hand at the craft. He started small, making silver orchids in eternal bloom, planted in clay pots. The first few sold to clients at You Work, I’ll Play Dog Daycare in Asheville, which he and Jill own. Commission requests came in for canine likenesses and from there his curiosity for nature led to wilder creatures. Lydic fishes for metal at Biltmore Iron & Metal Co., where he might spot a curved pipe that reminds him of a humpback whale’s form, or trolls Craigslist for a batch of vintage metal saw blades. He carries these treasures-in-the-rough to his backyard studio shed, and welds the pieces together like a puzzle. Initially, he shaped the scraps with a welder and Dremel, and then later moved up to angle grinders, a band saw, plasma cutter, and now forge to refine and expand his work. The collection of saws now form an ocean sunfish that’s given a sense of scale by a tiny scuba diver reaching out to touch a mammoth fin. Another piece, a nail-toothed anglerfish closing in on a snack, took 75 hours to construct from hundreds of metal washers. Electroluminescent wire forms the antenna-like protrusion that lures prey. 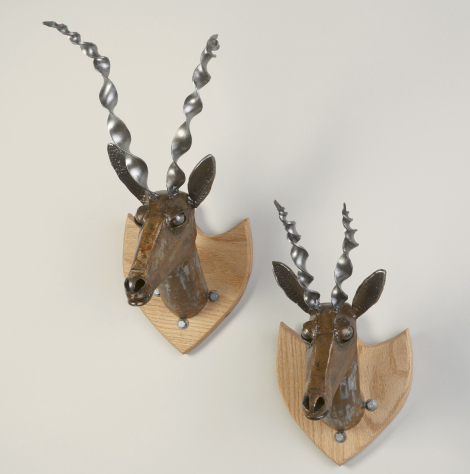 Among Jill’s favorites is Clarence the Deer, a sculptural collage of wrenches, railroad ties, garden trowels, washers, and nuts and bolts from her late grandfather’s workshop.